Did a massacre take place on January 28, 2007? Over 260 Shia pilgrims were killed when a skirmish broke out following the death of the pilgrims' chief at an army checkpoint in Iraq. Commentator Patrick Cockburn pieces together the other views. 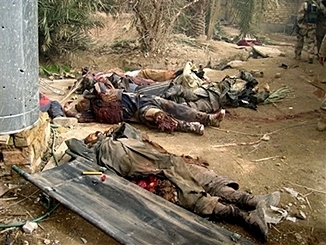 Baghdad - There are growing suspicions in Iraq that the official story of the battle outside Najaf [January 28, 2007] between a messianic Iraqi cult and the Iraqi security forces supported by the US, in which 263 people were killed and 210 wounded, is a fabrication. The heavy casualties may be evidence of an unpremeditated massacre. A picture is beginning to emerge of a clash between an Iraqi Shia tribe on a pilgrimage to Najaf and an Iraqi army checkpoint that led the US to intervene with devastating effect. The involvement of Ahmed al-Hassani (also known as Abu Kamar), who believed himself to be the coming Mahdi, or Messiah, appears to have been accidental. The story emerging on independent Iraqi websites and in Arabic newspapers is entirely different from the government's account of the battle with the so-called "Soldiers of Heaven", planning a raid on Najaf to kill Shia religious leaders. The cult denied it was involved in the fighting, saying it was a peaceful movement. The incident reportedly began when a procession of 200 pilgrims was on its way, on foot, to celebrate Ashura in Najaf. They came from the Hawatim tribe, which lives between Najaf and Diwaniyah to the south, and arrived in the Zarga area, one mile from Najaf at about 6 am on Sunday. reporters talk to the wounded. Heading the procession was the chief of the tribe, Hajj Sa'ad Sa'ad Nayif al-Hatemi, and his wife driving in their 1982 Super Toyota sedan because they could not walk. When they reached an Iraqi army checkpoint it opened fire, killing Mr Hatemi, his wife and his driver, Jabar Ridha al-Hatemi. The tribe, fully armed because they were travelling at night, then assaulted the checkpoint to avenge their fallen chief. Members of another tribe called Khaza'il living in Zarga tried to stop the fighting but they themselves came under fire. Meanwhile, the soldiers and police at the checkpoint called up their commanders saying they were under attack from al-Qai'da with advanced weapons. Reinforcements poured into the area and surrounded the Hawatim tribe in the nearby orchards. The tribesmen tried - in vain - to get their attackers to cease fire. American helicopters then arrived and dropped leaflets saying: "To the terrorists, surrender before we bomb the area." The tribesmen went on firing and a US helicopter was hit and crashed killing two crewmen. The tribesmen say they do not know if they hit it or if it was brought down by friendly fire. The US aircraft launched an intense aerial bombardment in which 120 tribesmen and local residents were killed by 4 am on Monday. The messianic group led by Ahmad al-Hassani, which was already at odds with the Iraqi authorities in Najaf, was drawn into the fighting because it was based in Zarga and its presence provided a convenient excuse for what was in effect a massacre. The Hawatim and Khaza'il tribes are opposed to the Supreme Council for Islamic Revolution in Iraq (SCIRI) and the Dawa Party, who both control Najaf and make up the core of the Baghdad government. This account cannot be substantiated and is drawn from the Healing Iraq website and the authoritative Baghdad daily Azzaman. But it would explain the disparity between the government casualties - less than 25 by one account - and the great number of their opponents killed and wounded. The Iraqi authorities have sealed the site and are not letting reporters talk to the wounded. Sectarian killings across Iraq also marred the celebration of the Shia ritual of Ashura. A suicide bomber killed 23 worshippers and wounded 57 others in a Shia mosque in Balad Ruz. Not far away in Khanaqin, in Diyala, a bomb killed 13 people, including three women, and wounded 29 others. In east Baghdad mortar bombs killed 17 people. Note: Patrick Cockburn is the author of The Occupation: War, resistance and daily life in Iraq (published by Verso), a finalist for the National Book Critics' Circle Award for best non-fiction book of 2006.